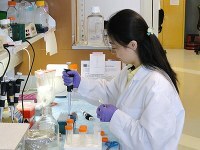 Members of the University of Louisville Department of Medicine are working hard in labs and clinics producing novel and groundbreaking research to benefit the health and well-being of the world community. Those efforts require the financial means to continue toward the goal of making the world a better place through breakthroughs in research. While certain grant funding makes headlines, all is vital in the mission to advance the knowledge of clinicians and care-givers to better treat their patients and help them live their lives to the fullest. We congratulate the members of our department whose hard work, dedication and curiosity make it possible to move forward in those quests. Work and Compassion Satisfaction, Burnout and Secondary Trauma Among Hospice and Palliative Nurses: Does Certification Make a Difference?